Of the twelve cruises we have taken this one ranks at the bottom. Not everything was terrible, but the exceptions were few. The good: Probably the easiest boarding we have had. There was no confusion, no running around looking for something. The boarding process probably lasted fifteen minutes. The ships overall appearance and décor was exceptional. The look of wood with all the trimmings made you feel comfortable and very warm. For a ship just refurbished two years ago there is a lot of wear and tear. The bad: The staff appears more disinterested than any other ship we have sailed. On most of the ships we have cruised there seems to be an attitude of making you feel like a guest, far less on this ship. The lido staff is downright unfriendly. On many occasions a staff member removed either a plate of glass from the table, we would say thank you, just to be ignored. Problem solving seems to be absent. Our transfer from the ship to the airport was arranged by the excursions department. Heathrow airport is one of the largest in the world. I stopped by the desk to verify the correct terminal. I was told I would have to go the library upstairs log onto a computer, at my cost, to verify the correct terminal. Only after leaving I decided this was not right and returned to the counter just in time to find another associate giving her instructions on how to find this information. Two questions, one why was someone new not given instructions on how to handle questions, and second why not try to get the guest to return. The ugly: Our booking agent had us select the 8:30 dining saying “they have open seating like other ships, just request other dining times”. When we asked the Maître D about open seating we were informed not on any Cunard. Not solving the problem then he haughtily told us to return on the following day and he “would see what he could do”. Makes you really feel like a guest. Tendering. On two occasions we tendered into port. First being Edinburgh. Along with the ships tenders we also had a large ship used for this purpose aiding in the process. Even with the larger ship there was still a delay over an hour and a half. The second was in Guernsey. This was a horrible experience, with over a three and a half delay. Some people waited over four hours. Very poor planning. We enjoyed this cruise. The ports of La Rochelle and Gijon were very industrial and far from the city. Ship was very clean and service was excellent. A wonderful experience, especially for an American who was surrounded by Brits and Australians, we only me 5 other Americans on board. Very lovely ports. Totally loved the voyage. Cunard does it right. We couldn't have asked for a more perfect holiday. Nothing was impossible. Nothing was too much trouble. Nothing was denied. We were never told no. It was our first cruise on one of the queens but it won't be the last. The balcony of my room was a delight to watch the ocean and sun bathe. although it took some time to adjust to a was llate dining option [8:30] i luckily was assigned to a dining table of mostly single voyagers who were delightful. The Queen Elizabeth design was beige and wood. It reminded me of a traditional British Club. I was disappointed with the lack of glamor. The entertainment was wonderful and presented in a vibrant setting. The lectures were interesting. There were plenty of public rooms to spread out in. We enjoyed the wonderful service of Puma, our room steward, Louisa in the salon, Robert and Avish in the dining room and the knowledge of wine steward Cletin. The sailing into New York was fantastic! The only down note was the immigration process in New York, where some passengers sat all afternoon in the immigration hall until all passengers got off the ship. My husband and I opted to stay in our room and then a public room until final call. We only sat in the hall about one and 1/2 hours. we enjoyed the cruise a lot even though the weather conditions were not ideal many times. The shore excursions arranged were limited, but since weather conditions were bad, they continued with the programs. As the cruise was docked for the day, perhaps a later start for the excursion could have improved the sightseeing. as it was a late cruise time (winter time) many of the follow passengers paid a great deal less than the early birds, those who booked earlier in the year. We found many had paid close to 50% less! Everything was perfect from the correct manner of the Restaurant waiters and stateroom attendant to the overall cleanliness of the ship. I have to follow a strict Gluten free diet and the only gripe against Cunard was that on day 6 of a 12 day cruise all the bars on the ship had run out of Gluten free beer (St Peters) I visited the Pursers desk and complained and to Cunard`s credit they restocked the bars with a Spanish Gluten free beer on day 9. Spent a most enjoyable 12 nights aboard this beautiful ship. Could not fault the cabins, service or food. However we were very disappointed with the daytime activities offered. Unless you like constant quizes or your body is falling apart and require costly treatment for such things as puffy legs, constipation, sore backs, wrinkles, poor indigestion, acupuncture, fluid retention and poor circulation, brittle nails or cracked heels etc there is not much else to do. There were dance lessons which were free and fabulous, but unfortunately there were only a few. These classes were full to bursting so were obviously really popular so more should have been organised as this is a very good way of exercising. Shops onboard expensive and not great. Photos are also extortionate. The ports visited were the deciding factor to book this cruise. We enjoyed the ports but the down side was the ship embarked and debarked approximately 750 passengers both in Hamburg and Kiel. This caused problems with Immigration when returning to Southampton and it also disrupted the flow of the cruise. Not so bad at Hamburg but in Kiel you had new passengers acquainting themselves with their surroundings while the other passengers had settled into a relaxing routine. The ship is beautiful, food and service were great, entertainment disappointing. My friend and I recently took the 1 week Mediterranean Cruise from Rome - Florence- Monaco- Toulon-Barcelona-Rome. While the Queen Elizabeth was a very nice ship, excellent appointments and amenities, excellent service, great food, I guess our expectations were of even more luxurious cruising than we had. We have sailed Celebrity, Norwegian and Royal Caribbean and thought the Cunard would be at the top of the luxury lines. We were disappointed. There is definitely a "first class" for those who can afford it, the grill suites. The rest of us were excluded from their restaurant, couldn't even take the elevator to their level 11. Felt like we were back in the 1910's on the Titanic. We love the formal elegance of assigned dinner time and seating, the formal nights, the diversity of passengers fit our "niche market" perfectly. Many wonderful people from Britain, Canada, Australia, U.S., Japan, etc. We had a terrible experience when we docked in Toulon, France and I don't feel like Cunard handled it at all. We did not have an excursion planned, it was a rainy, miserable day and most people stayed on the ship. We took a cab into town, where at a local mall, a strange man came up to my friend, said something in a language we did not understand (not French) and made a slicing motion across his neck, suggesting he wanted to "behead" her. He did it twice. There was absolutely no security or police presence to report it to, we left immediately. When we returned to the ship, I tried to report our experience to the purser and asked for the Director of Security to report this incident. We were basically "blown off" and told there was nothing they could do since we were not on an excursion. I understand you go ashore at your own risk, but we were not referred to someone in higher authority and our concerns for future passengers safety in this port were ignored. 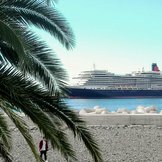 It really scared both of us and left us with an unpleasant experience both in Toulon and Cunard's handling of our concerns. Our balcony stateroom was comfortable, attractive, but less areas to place personal items than on previous cruise lines we had sailed. The entertainment options in the evening especially left a lot to be desired. No one "folded towels like animals", there was no brunch with carved fruit like we have had on previous cruises. We missed those luxuries and our expectations for Cunard were set too high for what we experienced. We did get our money's worth as I bought our tickets on a discount site, but don't sail the Cunard expecting total luxury, at least the Queen Elizabeth. I guess the Queen Mary is their top of the line ship. We had a group of 2 couples on this cruise, all over or near 65. 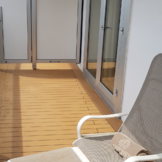 We had roomy (by comparision)staterooms with balcony. Everyday there were many land tours or on board programs. At night, we were at the 6 pm main seating, 8:30 for the theatre show, 9:30 for the Queen's Ballroom and danced until midnight with a live band. During at sea days, we were busy with choosing what and where to eat on the ship, which program to participate and sun bath on the pool side. At the ports that we visited, there were well planned boarding procedure which were systematic,orderly, hassle and worry free, and many times, the shuttle bus to city centre, or tender (small boats that shuttle between the ship and the pier) were free, and no long waits. The staff were always there to provide help. The passengers' launderettes were very convenient. We loved the Britannia Restaurant which provided very good food and good service. Lido (Buffet casual dining) was excellent. The food were beyond our expectations. The desserts were different everyday, and everyone was remarkable. I took a Ship's Galley tour that visted the ship's kitchen, and took a photograph with the Executive Chef to show our appreciation. All the written guides to each port were provided with maps and detail information. 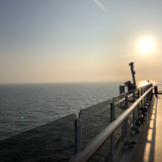 In summary: I loved this cruise, and recommend it. My husband and I have cruised over 8 times with different lines, and by far this is the best. Entertainment, food, housekeeping, tours, all deserved the top ranking 5 stars. We definitely will go again with Cunard. Best cabins that I've ever had. They were huge! And this was an absolutely beautiful boat. It does have the only ballroom afloat, so I would strongly suggest dancing lessons before the cruise. It was a quiet cruise, and tended to appeal to an older crowd. This is both good and bad. Good, since it made for a quiet, relaxing cruise. Bad, since all activities tended to be geared towards an older crowd. Dining room food was amazing. Buffet was average, with mostly British food. Definitely an upscale cruise for a lower price. All Cruises are great. Please don't get me wrong, but this Ship, really caters to U.K. citizens, in most every way.My travelling companion, noticed how we were treated, once they realized we were Americans. From the Shore Cruise Desk, and especially the Pursers Desk, to most every contact with personnel working on the ship. Exceptions were my Waiter, Avish and assistent- Natalia, and my Cabin Stewards, Rey and Raul. The ports were great,and interesting. All places I had never been, and am glad to have seen, on this cruise. The Queen Elizabeth is a Beautiful Ship, with that old-time British understatement of luxury. All in All, a very nice time. I have been on many cruises, with many Ship Brands, and for a rating of 3, on a 6 star level, this was adequate. So disappointing!Using your air connections, the layovers were horrible. We missed Venice altogether. then we found that the bulk of passengers were either Japanese or British (almost no Americans) which left us feeling " out of it". We were dismayed to find that these passengrs got much better "deals" as well.Was there no other choice for breakfast besides eggs, tomatoes, and beans?When I describe the cruise as Brown, I mean that to say that it was BORING. We have been on over 40 luding two on cunard,and never experienced such boredom. The entire ship was decorated in shades of brown. Our cabin was so brownish that I had to order a bouquet of flowers just to add some color! Cabin service was very good once we got a softer mattress to ease our hip pain. Onboard Activities reached a new level of boredom, and the shows were so poor (excepting the comedian ) that we walked out on two (singers) and fell asleep at another! Even the crew couldn't believe the lifelessness of this particular cruise.What happened?? Was it because the cruise was out of season?? We were really looking forward to sailing the Queen Elizabeth, but were so disappointed.The bars and lounges were empty or closed early. Then there were the ports. Just huge piles of rock! !The excursions were overpriced and , although we took only the EASY sightseeing ones, we found them barely interesting. Resorting to the spa for something to do, I was astounded to find that a dip in the indoor pool would cost $99.00!! On the upside, the food and service in the dining room were great. The selections at the buffet were tasty and varied.The entire staff was excellent. The first thing I noticed upon boarding was the ease ,efficiency, & extremely courteous members of the Cunard team that helped us to get on the ship without any difficulty. We were greeted upon boarding & our luggage was in the room within minutes of arrival. The staff was great., the service was 5 star, & the cleanliness & appearance was fantastic. The balcony room was much better than I had anticipated. The entire experience exceeded my expectations. This ship demands high level. For example, tuxedos are expected at dinner on four of the nights. Other nights require men to wear at least a coat, and some times tie. No informal nights for dinner were allowed including the last night. The tours were well handled and the "help" were very good, going out of their way to insure that all details were taken care of. We especially enjoyed the lectures from well known people who knew what they were talking about. Service at the Britannia Club was excellent. All the staff was very polite and well trained. The ship is beautiful and very well kept.